To produce an aluminium extrusion a length of aluminium of a constant cross section- a preheated round ingot is squeezed at high pressure through an orifice of the required shape in a steel die. The extruded section produced can be solid or hollow, simple or complex, large or small. Hollow sections are usually made the use of a die containing a mandrel attached to a bridge. The aluminium-extruded stream of metal is split at the bridge and re-united at the mandrel before emerging from the die. Aluminium sections of astonishing complexity can be extruded, which is a great stimulus to imaginative and economic design. The size of the section is limited by the size of the ingot container in the extrusion press and is measured by the circumscribing circle diameter (CCD) required to enclose its cross section. Most aluminium sections have a CCD of less than 200mm. 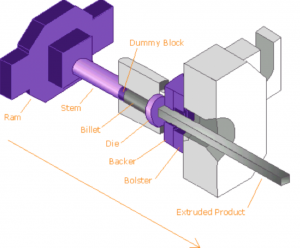 The principle of an extrusion press can be seen in the schematic diagram attached.